All the prayers are incomplete and any kind of worship is not possible without the element of devotion in it. Devotion is the easiest way to get liberation, which a struggling soul will be keen to secure. A piece of iron sinks in water but when the same is beaten into thin sheets, they can be used to build a boat to ferry us across a river. Desire, not for worldly gains but as an aid to devotion, serves as a venerable trait. 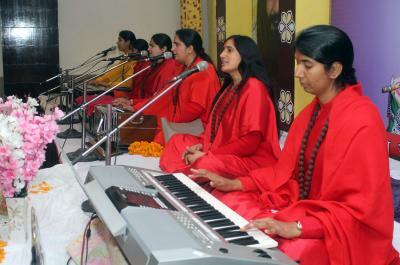 To fill the ambience with spiritual divinity, Divya Jyoti Jagrati Sansthan (DJJS), organized a devotional concert on 24th March, 2019 at Batala, Punjab. Mesmerising devotional bhajans were rendered and served their supreme purpose of enlightening the hearts and minds of the audience. The motivation and sense of realization was visible in the eyes of the audience. The spiritual discourser of the day- Sadhvi Jayanti Bharti Ji, disciple of revered Gurudev, unfolded various divine secrets from the world of spirituality. 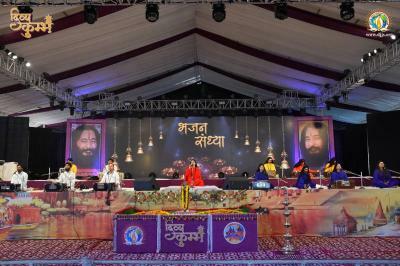 ‘Shri Guruve Namah’ - theme of the event created awareness about how the divine ocean that lies within us can only be experienced when a perfect spiritual master enters our life and bestows us with divine knowledge which opens the closed doors of our mind and shows the target of our life. Then only, one can experience the world of true spirituality within where one can find the hidden treasures of happiness and peace. Under a true master’s guidance, each disciple strives to follow the path of righteousness and fulfil that true purpose. Life can flow with the streams of divinity and devotion only when one has the practical experience of God through Divine Knowledge (Brahm Gyan). Since its not limited to physical level, it brings changes at the soul level also. The concert successfully served its supreme purpose by touching the right chord and helped audience introspect the purpose of being.